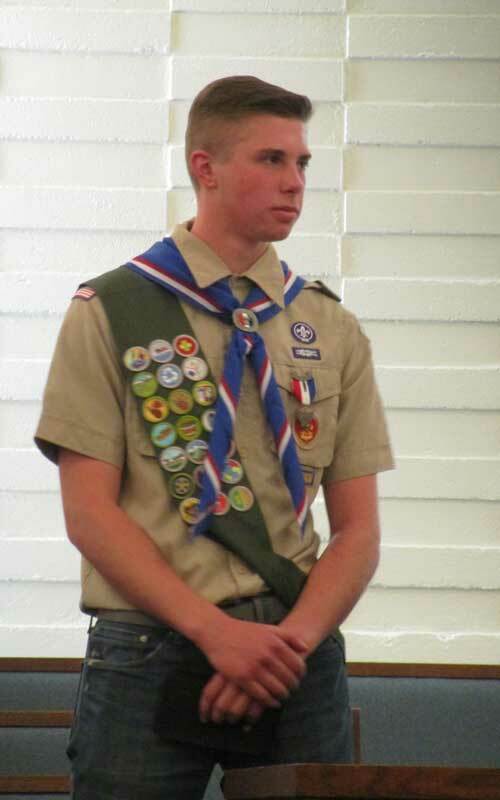 At his April 22 Eagle Court of Honor ceremony, Eagle Scout Ethan Hefner listens as several speakers talk about his “Trail to Eagle” as a scout with Boy Scout Troop 158 in Susanville. Only about 5 percent of all scouts earn the rank of Eagle. That calculates to about 1.7 million Eagles in the Boy Scouts 108 year history. 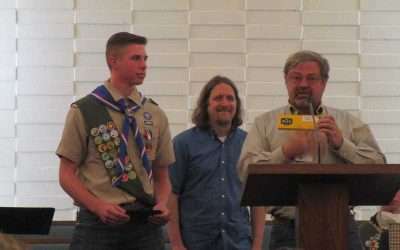 Ethan Hefner with Susanville Boy Scout Troop 158 was recognized for achieving the rank of Eagle at his Eagle Court of Honor held at the Church of Jesus Christ of Latter-day Saints on the evening of April 22. 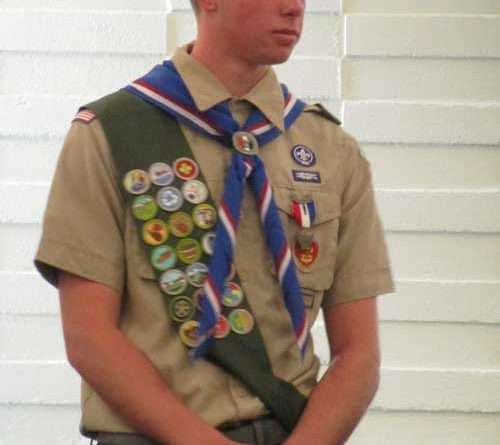 The more than 30 people in attendance were edified by several speakers as to the many challenges that a scout must conquer in the quest to become an Eagle Scout. His parents, scoutmaster and other scout leaders explained about the minimum requirements to be considered for Eagle Scout. Among the most basic include a minimum of 21 merit badges, 12 of which are specific to the rank and a minimum of 20 nights camping at designated Scouting activities or events. One long-term camping experience of up to six consecutive nights may be applied toward this requirement but all must include sleeping each night under the sky or in a tent you have pitched. A more important aspect of the ‘Trail to Eagle’ is the need for the scout to successfully fulfill positions of leadership while pursuing their Star, Life and Eagle ranks. That is a total of 16 months of learning leadership skills and responsibility. One of the final challenges is to conceive, plan and carry out an Eagle Leadership Project. This project is not just a one-time service project, rather a service concept that will benefit the community into the future and one that requires substantial manpower support outside the scout’s family, but under his leadership. Hefner’s project took him all the way to the Chester Cemetery where he and his crew photographed and cataloged each grave site in the cemetery, which was then submitted to an Internet data base to aid people in finding the resting place of friends and relatives. Because these endeavors are not for the faint of heart not every boy who joins a Boy Scout troop earns the rank of Eagle Scout. In recognition as one of those who have persevered the challenges, the Susanville Sunrise Rotary presented Hefner with a Buck Knife engraved with his name, date of his Eagle rank and Eagle Scout insignia. Sunrise Rotary member Gary Felt reminded Hefner that achieving this rank is an accomplishment, but more than that, it is the beginning of a new chapter in his life and the community has great expectations from him.